Crack a TV out of the box and you’re usually greeted with a veritable snake pit of wires, connectors and a huge plethora of settings that you’d have to navigate just to get it working, never mind the fact that you still haven’t even had it installed yet. 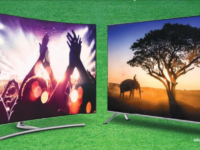 To tackle this head-on, Samsung’s new QLED TVs for 2018 have prioritised easy installation and setup. 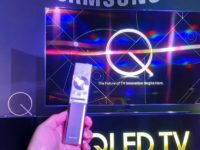 Instead of figuring out which cable goes to which port, the new QLED TVs have just one cable, dubbed the Invisible Connection cable that handles both power and connections to the TV and which in turn is connected to a One Connect Box that has all the ports and the processor powering the telly. 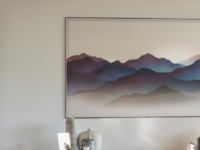 There’s actually an invisible One Connect cable in this picture connecting the Samsung QLED TV to the mains. Serious, there really is one. The next step, populating the TV with all your content streaming channels and integrating it as part of your home network is usually the most irksome step of all as you have to painstakingly enter every single darned one of your accounts with a virtual keyboard. Samsung’s new tellies skip that step entirely and handle the grunt work for you. 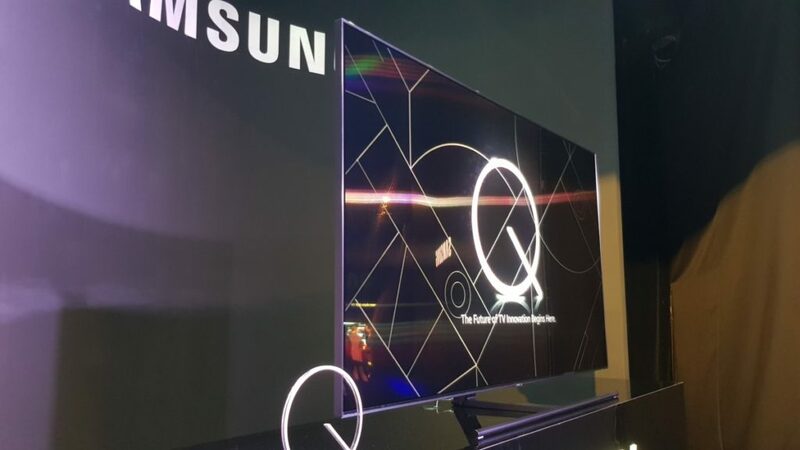 To do so, the new QLED TVs essentially pairs up and connect to your smartphone via Bluetooth and automatically sets up all your content streaming accounts like Netflix, Spotify and the like by drawing all your account details off the phone, allowing you to set things up without significant human intervention. 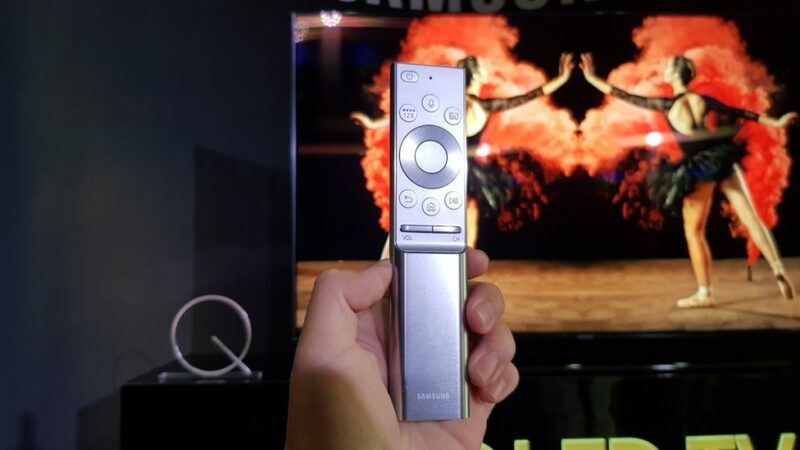 On top of the bundled One Remote, users can also use their own smartphone as a remote control too which comes in handy if you misplace said remote. The updated TVs also have Bixby integration, allowing you to search for content across your TV and other hooked up streaming services. 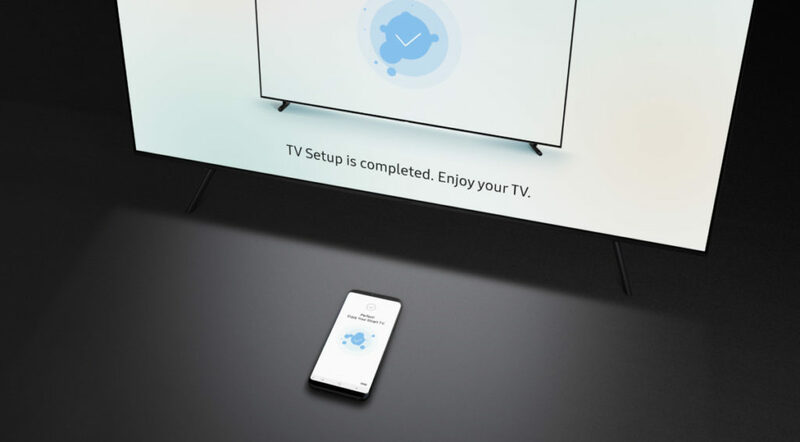 While it works best with Samsung phones, the new TVs will work with a SmartThings app that’s compatible with Android phones running Oreo 8.0 and up and iPhones running iOS 6.0 and up; you’ll also need a Samsung account as well though that’s a given by owning a Samsung QLED TV. 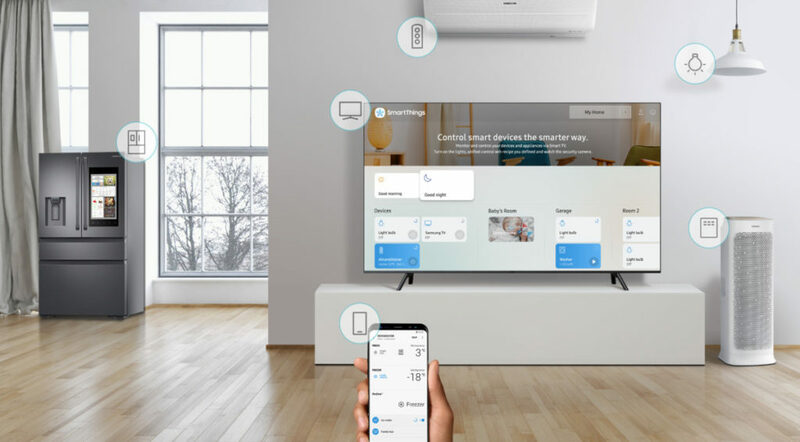 The Samsung SmartThings app also lets you remote control other connected devices like your air conditioner, lights and the like and even set device and user profiles so you needn’t have to tweak a bunch of appliances repeatedly in certain scenarios like turning on the lights before you get home. 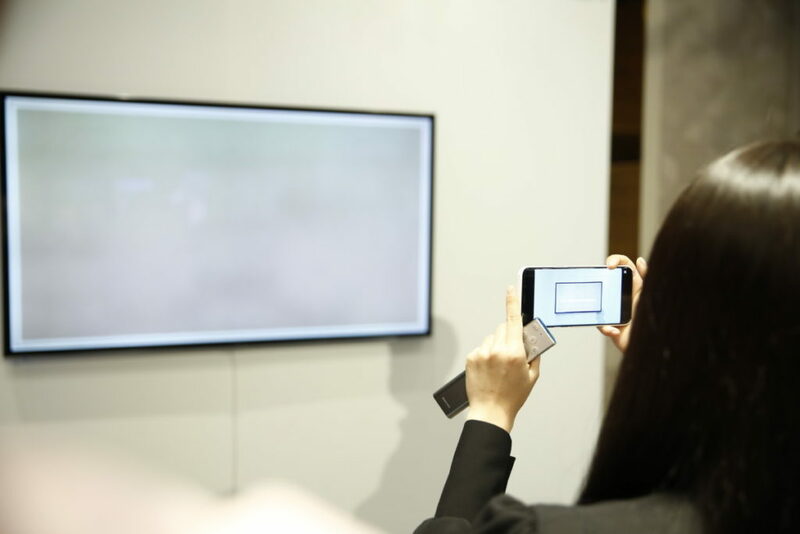 It goes without saying that picture quality is the main focus on top of user interactivity and enhanced functionality in Samsung’s new generation of QLED TVs. 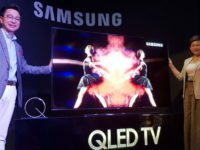 This time around, the new QLED TVs, starting from the higher end Q9F and Q8F series models integrate Direct Full Array backlighting as well as a series of updates with a more refined, finer Quantum Dot lattice so as to offer richer, deeper and fuller colours to the tune of what Samsung calls “100% Full Colour” – effectively the full breadth and depth of colour encoded in a given piece of content be it a video or a game is displayed in full glory on the QLED TV. 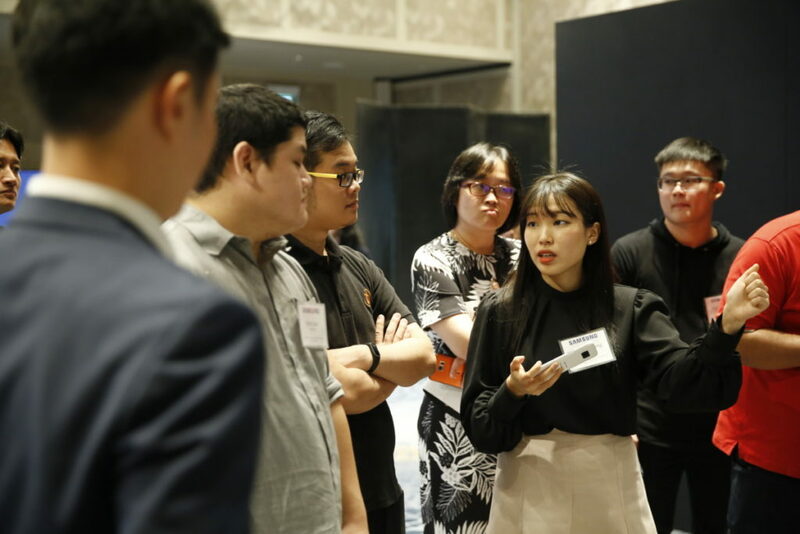 More tangible improvements were on display as well in the recent Malaysia launch, with the new QLED TVs tackling black levels in a more competent fashion along with much better contrast on account of dynamic tone mapping, effectively ensuring that shadowed parts and overly bright highlights were both handled individually to ensure that details remain crisp and sharp onscreen. 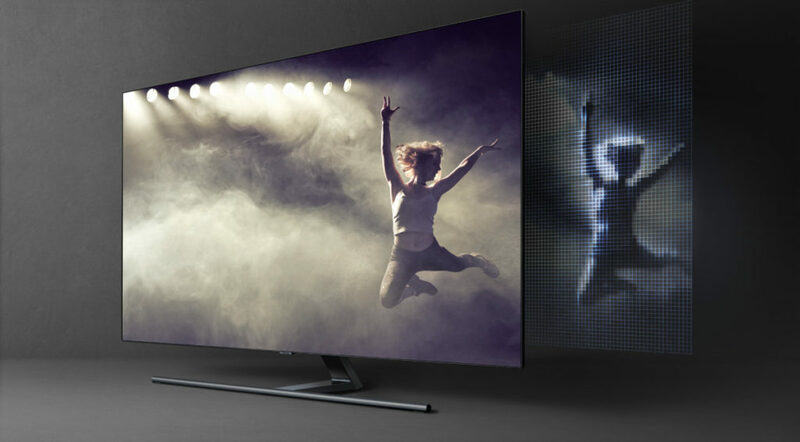 The new QLED TVs are also forward looking as well, with support for Samsung’s own new HDR10+ standard that has big-names like Panasonic and 20th Century Fox backing it up on top of support for existing HDR10 standards. Essentially, the current HDR10 standard is limited as it uses static metadata. This is a set of instructions in a given piece of content that tell the black levels and brightness in a film for a TV to handle. Unfortunately, a given movie changes lighting levels from scene to scene which can lead to subpar results. HDR10+ instead uses dynamic metadata, allowing content providers to determine these black and brightness levels on a scene by scene basis. The end result? Better looking content in the form of punchier colours and better highlights especially if it is encoded with HDR10+. While the format isn’t particularly common now, Amazon has pledged support for the format along with the aforementioned big-names with some content like The Man in the High Castle already available with HDR10+ support for streaming on Amazon Prime. It’s likely only a matter of time before HDR10+ encoded Blu-rays make their appearance though in any case, Samsung’s QLED TV’s still bear support for existing HDR10 content so your bases are still covered.